Home›Regions›Southeast›Roll Aboard! What Ever Happened To The Promise Of Bike Racks On Trains? Roll Aboard! What Ever Happened To The Promise Of Bike Racks On Trains? DETROIT—In some states, Amtrak riders bicycle to their respective stations, roll their bikes aboard and, upon arrival, ride them off to their destination. In others, riders can pack a disassembled bike, a bag of golf clubs or a gun as checked luggage. Yet Michigan Amtrak routes lack checked luggage accommodations and feature museum-worthy trains with limited space. As a result, bicyclists, pistol-wielding or not, have to leave their bikes at home. But after years of delays and hearsay, bikes onboard Michigan trains may soon finally be a reality, officials say. Thomas C. Carper, chairman of the board for Amtrak, recently penned a cheery letter to theLeague of Michigan Bicyclists outlining bike-friendly developments to Michigan’s antiquated railroad cars. When the revised design is completed, Carper says, it’ll be placed into service first on Illinois routes this summer to ensure it’s safe for both bikes and passengers. If no other revisions are needed, Amtrak plans to retrofit the bike racks aboard Michigan trains. The letter doesn’t address an exact arrival date for retrofits, but for the last couple of years “hopefully soon” has often been the reported ETA from top brass at the Michigan Department of Transportation and Amtrak. And then there’s the even better news: Michigan’s getting an entire new fleet of trains—with bike racks already installed. According to a report by the League of Michigan Bicyclists, the new coaches will be modeled after California cars and will provide 12 spaces for bikes, as well as space for up to 16 additional bikes within the new baggage cars. Bikes aboard trains means Michigan is one step closer to a contiguous multi-modal public transportation system. In plain English, that means planning a trip only using public transportation will become more efficient and effective—in both time and cost. Across the country, bicycle tourism is thriving, and getting bikes on trains in Michigan will finally offer an opportunity for the state to capitalize on a growing market. ‘Annually, $46.9 billion is spent on meals, transportation, lodging, gifts and entertainment during bike trips and tours across the country,’ reads one report from the League of American Bicyclists. “We're missing out on those cyclists’ tourist dollars coming into our state,” says John Lindenmayer, policy director of the League of Michigan Bicyclists. More than 300 cycling events will take place in Michigan this year, but without racks vacationing Chicago residents are without a means of getting their bikes across Michigan. People want our beautiful back roads, says Lindenmayer, and to be able to partake in Michigan’s beauty by bike. Despite the promises of a new fleet of bike-friendly trains, long-time advocates remain apprehensive about Amtrak and MDOT’s commitment to retrofitting the current cars. The still-corked celebratory bottle is due to years of half-baked promises cooked with good intentions from MDOT and Amtrak. For years, advocates like the League of Michigan Bicyclists and the Michigan Environmental Council have stated that since Michigan has the same train models as Illinois, which allow bikes, Michigan trains should just implement Illinois’ approach. On some Illinois trains, riders have one of two options: For no charge during off-peak hours, they can simply schlep their bike aboard, wheel it to a handicapped seating area, flip down the seats and secure the bike to the bottom of the seat frame. Or, they can pay $10 and reserve a space for a bike to be stowed in overhead luggage racks. With a lot of empty seats, sticking bikes in some of these places is okay, Hoeffner adds, but with the large volume of passengers that Michigan routes haul, it gets to be a little more problematic. 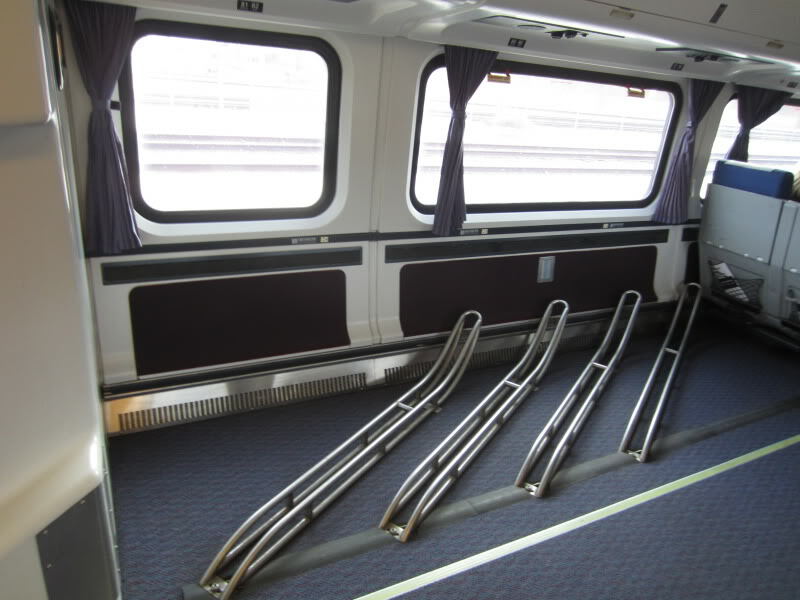 Hoeffner and Magliari both agree that displacing space for handicapped riders in any capacity is not an option aboard Michigan’s crowded trains. But for what authorities deem a logistically thorny predicament, advocates believe is a fairly straightforward one. For the past two years, the Michigan State Rail Plan has called for retrofitting accommodations to be made for bicycles on trains, but progress has been slow between Amtrak and MDOT. For example, in April of 2011, M-Bike, a blog dedicated to promoting cycling in Metro Detroit,reported that an Amtrak spokeswoman had told them all three of Michigan’s lines would have roll-on bicycle service that spring. 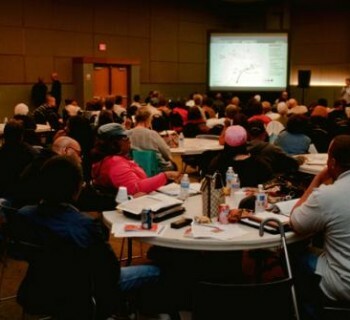 And this past winter, Lindenmayer tells me, all conversations with Amtrak and MDOT suggested a spring 2012 arrival. To further rally support, the League of Michigan Bicyclists, with the help of Lindenmayer, started an online petition calling for action. The petition’s page is strewn with zealous comments from bikes-on-trains supporters, and includes a letter for signees to send to Amtrak and MDOT. There are now almost 3,200 signatures. The Michigan Environmental Council, at one point even considered advocating for legislation that would bar the state from spending money on Amtrak until the rail service retrofits Michigan’s current trains with bike racks. Fischer says it’s important now more than ever that bikes-on-trains proponents remain vigilant in holding authorities accountable for these new hopes and expectation. “Because, after all these racks aren’t luxury items,” says Fischer.